A candy dish filled with these delightful cookies is a great way to make someone's day. After you’ve arranged cookies in the dish, wrap it in cellophane and tie it with a bow for a gift that looks as good as it tastes. For Cookies: Preheat oven to 350°F (175°C). In medium bowl, combine flour, cocoa powder, baking powder, baking soda and salt; set aside. Drop dough by rounded tablespoons onto parchment-lined baking sheet, placing cookies 2 inches apart. Bake cookies 9 to 12 minutes, or until firm. Cool cookies on pan 3 to 5 minutes or until set, then transfer to wire rack to cool completely. For Filling: In large bowl, cream together butter, fluff, and vanilla extract until light and fluffy. Add powdered sugar slowly; mix well. Spread flat side of half the cookies with heaping tablespoon of filling; top with second cookie to create sandwich. 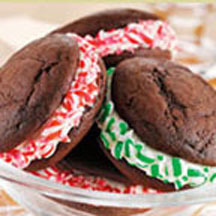 Roll edges in crushed peppermint candies; chill cookies to set filling.